Well, more like singing the praises of the blue-greens . . .
Obviously we're not done yet, although the list has grown considerably shorter (finishing the painting, cut the shelves for the built-in, install the gas line etc . . . ). But at least I can wash clothes again - those that have to be around us should appreciate that, although with the miserable weather they won't dry anytime soon. As an aside, we thought long and hard about building the laundry room on the second floor. The vibration issue is one we hadn't thought of, although hopefully it'll be somewhat rectified by the addition of the reinforced floor and pedestal - however we did do what we could to minimize the chance of a catastrophic water leak. 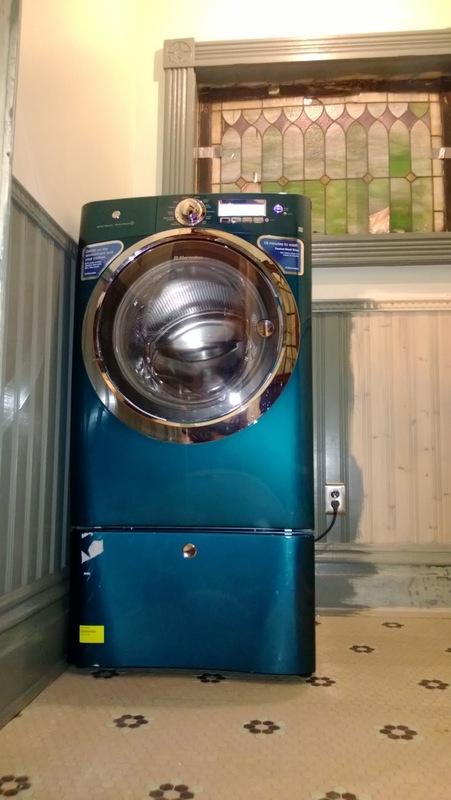 This device takes the place of the standard laundry water supply - it has a floor sensor that detects tiny amounts of water and will turn off the water in case of a leak. It also only allows water through if the washer "requests" it. 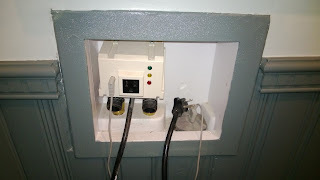 Obviously the braided supply lines are a must, and we also ran a bead of clear caulk around the baseboard to prevent water from flowing down the walls before the sensor can detect it. The only thing we gave up was the pan the washer previously sat in because the pedestal drawer wouldn't have opened. 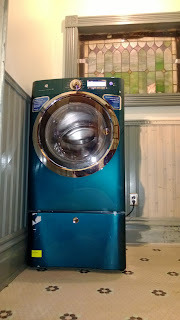 I fell in love with that blue washer. Wow. My washer and your huge laundry/mud room would be the perfect combination . . .